Many ways of studying English are really boring, right? Especially if you are learning with a textbook or sitting in a classroom with a teacher lecturing you on the structure and grammar of the language. But it doesn’t have to be boring: you can improve your English with something that you already love­—music! Whether you’ve experimented using music as a language-learning tool, or you’ve just listened to English music without ever trying to understand it, this article is going to teach you a process that makes “studying” English fun, effective, and simple. Plus, it guarantees that you remember almost everything that you learn! Does this sound too good to be true? Then keep reading! In every language I’ve learned, music has played a core part in my evolution as a communicator. For example, when I started learning French I found music to be one of the most effective ways of learning not just new vocabulary and expressions, but also grammatical mechanics, and even for improving pronunciation. After just a few months of learning, I felt that music greatly augmented my comprehension of the language and even my speaking. Almost everyone loves music, so this makes it one of the most powerful language learning tools available. And luckily for English learners, music in English is popular all over the world, so it’s easy to find songs that you are passionate about. I listen to radio in different languages a lot, which is a great way to find new music (I use Shazaam to identify them). When I find a new song that I like, I look it up on YouTube, with lyrics (if available). Then, I Google the lyrics for the song and print them out. Next, I grab my pen (I recommend using a highlighter, too) and I go wild. 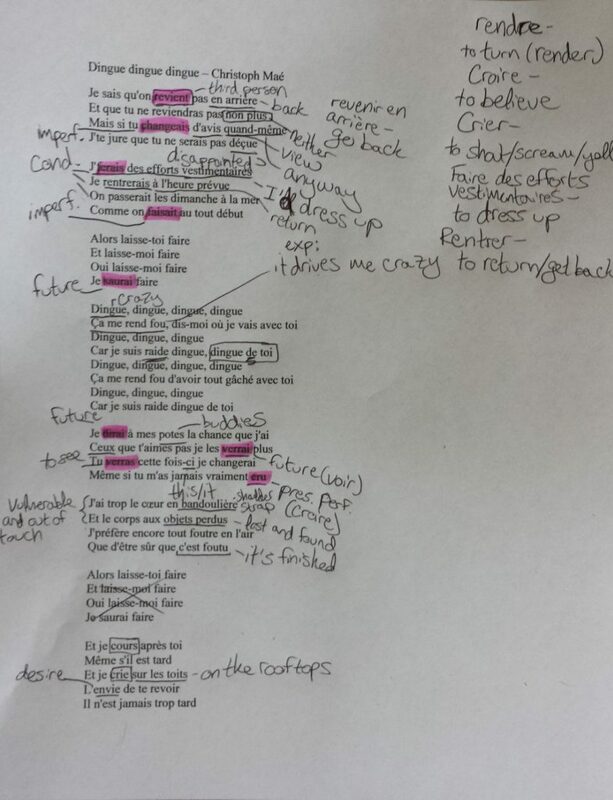 I completely mark up the lyrics, so that I can understand the entire song. I underline new words and expressions. I put a square around words that I recognize, but that I want to make a note of, so that I can memorize them and use them when I speak. I circle anything grammatical (like a verb in a tense that I don’t recognize). I like to use a combination of Google Translate and Word Reference to define new vocabulary and expressions. If your English is more advanced, I recommend you use an English dictionary to define the word, rather than just use a translation in your native language. This promotes immersion in the language. This process may seem simple, and maybe even obvious, but if you follow it, and adjust it to work best for you, you will revolutionize your English learning. Using music to improve your English is terrific because it includes language that native speakers use EVERY DAY. No boring textbook English that you have never heard in real life. Plus, it’s an awesome way to improve your pronunciation by singing. It doesn’t matter if you’re a good singer: sing when you’re alone, while you’re in the shower, or while you’re cooking. You’ll be surprised what a difference this makes in your pronunciation. This is because languages, by nature, are very musical. If you get used to singing in English, the pronunciation you learn will naturally seep into your speaking, so you can speak more confidently! Maybe you play an instrument. Try learning some English songs and singing along. What a great way to impress your friends and family! Or even that special hottie you’ve been eyeing. Don’t Study Grammar, Learn it Naturally! You can learn real life grammar naturally with music. A lot of the grammar rules that you’ve learned from school or textbooks are broken by native speakers all the time. In music, this quickly becomes apparent. You’ll see and hear things like sound morphing, which few English teachers would show you. If you’re proactive, you can also learn different parts of speech and conjugation. You won’t just study rules, you’ll learn grammar in context. You’ll repeat what you hear, so you’ll understand the rules without memorizing them–just like you do in your first language. By doing this, I’ve learned how to conjugate many common verbs in French and Catalan. I’ve learned how to use the future, the conditional, and the subjunctive in many cases, without ever studying or taking a class. I don’t have any gift for language learning… I just love music. Again, singing is important because it is another way that we naturally remember things. Think about anytime you hear a song from your childhood. Almost by magic, you generally remember all the lyrics, even if you don’t remember much else from that period of your life. So my advice is, sing, sing, sing. And now it’s time to put all of your hard work with this awesome song into Anki, so you remember everything you’ve learned! Make sure to read our article on Anki and other memorization tools. They are awesome tools for language learning! If you have a smartphone, then download applications like Anki, Flashcards Deluxe, Memrise and Quizlet, which will remind you to study every day! Doing this, your English is going to improve quickly. Plus, it’s a lot of fun. Be sure to check out Lyrics Training, too. There you can practice remembering the lyrics of all of your favorite songs. The best part is that studying with these tools doesn’t take long: less than a couple minutes per day, and we all have a few minutes of free time every day (at the bus stop, while waiting for a friend, at the bank, grocery store, etc.). The best way to learn English is by making it a fun, meaningful part of your life. Music is one awesome way to do this–so STOP just listening, and start learning! If you enjoyed this article, please comment below with your favorite song, and HOW it has helped you improve your English, aww yeah! Amazing! Thanks! So simple and so useful! Thanks again for your awesome job guys! Me also thanks much Tamie, very good and useful page!!! I love Real Life community! Awesome to hear from you. Thanks Bruno! Thanks so much, that’s awesome, I love music too.